Quick review of Arcade Hi Lo. Arcade Hi Lo is a very cool hilo game that combines the standard "higher or lower than this number" format with a Pinball / Pachinko machine. If you’ve never heard of Pachinko (I don’t blame you), think of the back of a 2p coin pusher machine from the arcade. In Arcade Hi Lo there are 15 buckets at the bottom of a Pinball-esque machine. A ball is fired from the top of the machine and bobbles down through the pins before landing in one of the buckets. If it’s higher or lower than the starting number (whatever you wagered on), you win. Simple I know, but it’s just so damn satisfying to watch. Fun rating score - 81%. "Arcade Hi Lo" is basic and the biggest payout isn’t great. Nor is there an option to gamble your wins for a massive accumulator. However, I genuinely do not care about these things as I simply love the way Arcade Hi Lo plays. Arcade Hi Lo is a prime example of a simple idea that works so incredibly well. Sure, the ability to accumulate your wins would be a nice touch, but it doesn’t take away from the pleasure of watching a ball-bearing precariously make it’s way around the pins and hopefully in to a winning bucket. Fact: Arcade Hi Lo hasn’t got the speed of Golden 7s hi lo or the massive potential payouts of HiLo Gambler, but what it does have is unique gameplay that is guaranteed to make you smile. 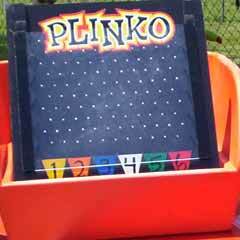 There’s a reason why Plinko was one of the most popular games on The Price Is Right, and it’s for that same reason that I give Arcade Hi Lo the grand fun rating of 81%. How do you play Arcade Hi Lo? Choose how much you want to gamble with. Select higher or lower than the current number. Fire the ball and hope it lands in a winning bucket. Arcade Hi Lo sticks to it’s roots by using a very simple hi-lo format. All it does differently is use a Pachinko machine to choose the results of each game. 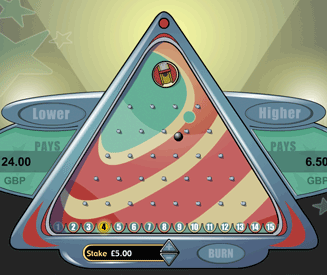 The results of every game of Arcade Hi Lo are chosen by a ball falling through a triangular Pachinko / Pinball / "Back of a 2p coin pusher" machine. Basically a ball is going to bobble across the pins before finally ending up in one of the 15 buckets at the bottom of the machine. Before the game starts, the little cannon thingy at the top of the machine will rotate over 360 degrees before finally coming to rest and shooting the ball. The cannon can and will fire the ball at any angle, which increases the randomness of the game. If you correctly wager on the ball landing in a bucket higher or lower than the current number, you win. If you incorrectly wager on the ball landing in a bucket higher or lower than the current number, you lose. If the ball lands in the same bucket as the starting number, you lose. Fact: The ball has an equal chance of falling in any of the 15 buckets, despite the fact that some buckets are further away from the centre than others. 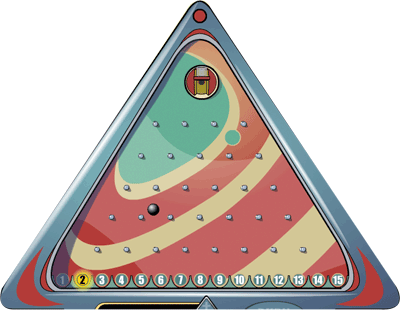 Basically, if you guess "hi" and the ball lands in a bucket with a bigger number than the starting number, you win. If it lands in a bucket with a lower number, you lose - and vice versa. Unfortunately, you will always lose if the ball lands in the same number bucket as the starting number. So if the starting number is 8 and the ball lands in the number 8 bucket, you lose. Before starting a game of Arcade Hi Lo you have the option to "burn" the current number. This will replace the current number with a new starting number, which could be better or worse than the last one. You only have one "burn" before the start of each game and you cannot burn on 1 or 15. If you don’t like the first starting number or the new number the burn gives you, I guess you can always reload the game. A cool (albeit ultimately useless) feature in Arcade Hi Lois the ability to pull up all the stats from your current game. The statistics window shows you a graph and percentage figures of all the recent results from each game you have played since loading up Arcade Hi Lo. Payouts in Arcade Hi Lo vary depending on the starting number and the likelihood of the outcome. For example, wagering "hi" on 12 will have a much bigger payout than wagering "lo" on 12. The following table highlights the different payouts for both high and low wagers on each number. Fact: The maximum payout in Arcade Hi Lo is 14.5x your stake (hi on 14, lo on 2) and the minimum is 1.02x your stake (hi on 2, lo on 14).